I went to the Ferry Plaza Farmer’s Market Saturday morning – besides the weekly shopping, I managed to score some (unsprayed) pink grapefruit, Eureka lemons, and (hallelujah!) white guavas. White guavas have a wonderful fragrance and a deliciously floral taste – quite different from the regular pink guavas and 1000% better than the guava juice you find in stores. And I had a recipe for white guava/Meyer lemon marmalade. So what could I do? I bought five pounds. At the farmer’s market, I met up with my weaving friend Alfred, who was coming down to play on Emmy. I drove us back to Sunnyvale, where we met another weaving friend, Carla, who was visiting from Maryland. Carla showed us her incredible double weave samples. She’s playing with color-and-weave double weave on two blocks, and the results are just amazing. And on only eight shafts! I may have to try this myself. Anyway, we got Alfred set up on the loom, and I got started on marmalade while Carla and I chatted. Marmalade is a three-day process, and I was just finishing a lovely Seville orange marmalade with rum, vanilla, and piloncillo (piloncillo is a Mexican sugar that typically comes compressed into cones). After that we went for a late lunch. They are easily bright enough to see clearly in a dark room; when the room lights are on, they provide excellent lighting in front and back of the castle, and pretty good lighting inside the shafts – much brighter than the room lights. I’m looking forward to threading with this setup! 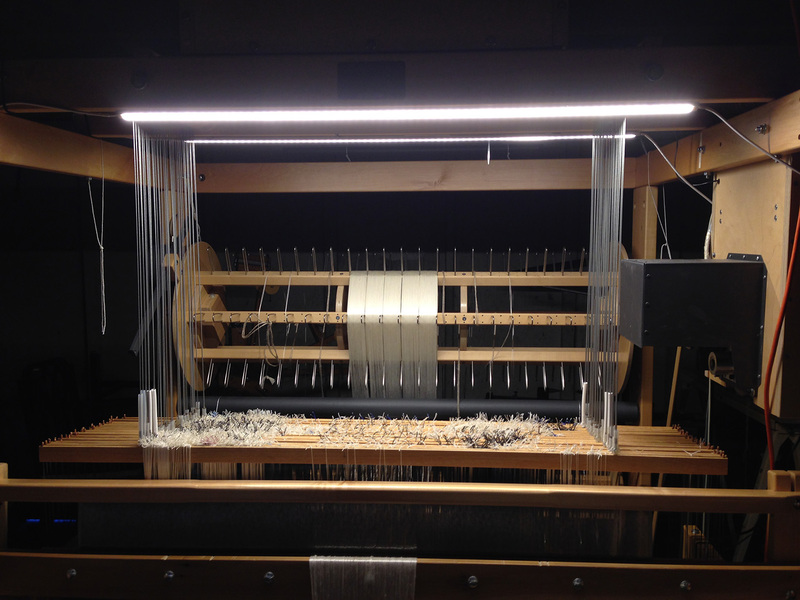 Setting up the loom lights was quick and easy – we just drilled two holes for each strip of LEDs, screwed in the clips, clipped in the LED strips, attached the power cables, and away we went. We did have to reroute some of the cables that had previously been clipped to the underside of the cable, but that wasn’t particularly hard. If you are interested in installing loom-lights of your own, and have at least a 1 meter (39-inch) castle, here’s what it took to hook up the loom: two 1-meter LED strip lights, a power supply splitter cable, a 12-volt, 60-watt power supply, and a standard IEC 3-pin power cable. We didn’t buy that one since Mike already had one hanging around, but it looks much like this one from Digikey. After installing the loom lights and weaving a bit more, Alfred went home, and I went back to marmalade. Between Saturday and Sunday, I finished four types of marmalade. The first was Seville orange with vanilla, rum, and piloncillo. The second? Seville orange marmalade with ginger and cinnamon. Wonderful blend of warm spices with bitter orange! Third was Seville orange marmalade with coffee and cardamom – my favorite of the four, it sounds weird but tastes incredible. The coffee adds a subtle bitterness and more complex flavor – next year I will have to try some of this in chocolate! The final marmalade was the Meyer lemon and white guava marmalade. This unfortunately required way more cooking than I had expected, so it came out a little caramelized. It’s still delicious, but I thinkÂ I can get more from this recipe. I will have to try it again! Still on the marmalade plate are: plain Seville orange marmalade (because Mike likes it), grapefruit/lemon/Seville orange marmalade, Meyer lemon/Page mandarin/lavender marmalade, and maybe grapefruit marmalade with rose geranium or rosewater. I already have a lifetime supply of marmalade, but I can’t stop making it! It’s tremendous fun and thoroughly enjoyable. It might be worth noting that this is a loom where the LED strips are about 2 feet away from the shafts (at rest) — it might be too much brightness on a smaller loom where they’re about a foot away — on your old loom we used LED strips that were about 1/4 as bright. I have been struggling with light on my 30″ AVL but the castle is only 36″ in width on the outside. Grrr. Look through the offerings on Superbrightleds.com . They may have shorter lengths, or you could use the adhesive-backed tapes which I think you can cut to length. That’s what we did on my Workshop Dobby Loom! You are sooo awesome!!!!! I am putting together my 48″ PDL and will get some of those lights as well. Lovely loom and lovely weaving! We have LED strips in our kitchen – about 2 ft long, attached to underside of cupboard with staples, several can be plugged together, controlled with a remote control that also controls the brightness. Never thought about putting it on my Weavebird! Cool idea! Tien, wow, how proud can you be. So glad you made it to get your loom and get it set up and working. Been following all of your adventures. Problem here. 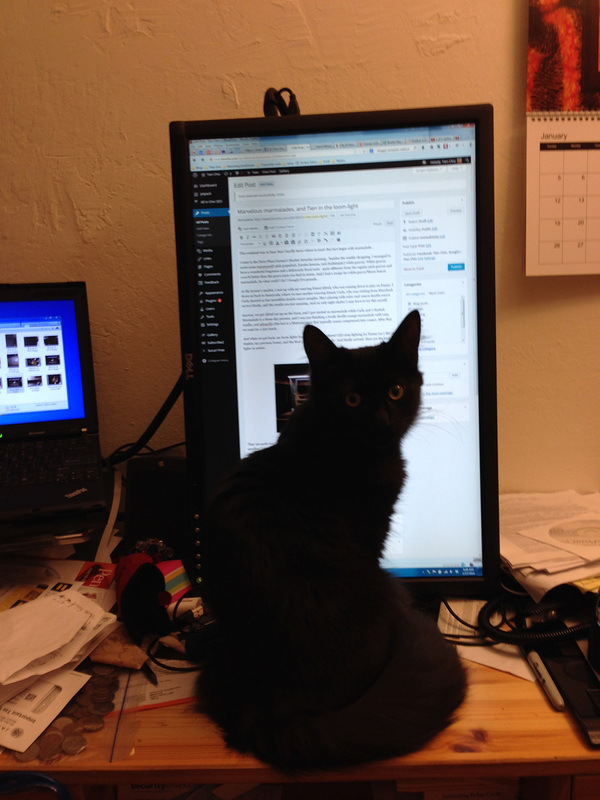 I am supposed to be on your blog because I realized that I hadn’t been getting it. So I picked up this one on Weave Tech. I had re-entered my email and it said I was signed up. I am taking your class in March in CO and am very excited about your coming. I am a fan, aw gee. Love your cats also.